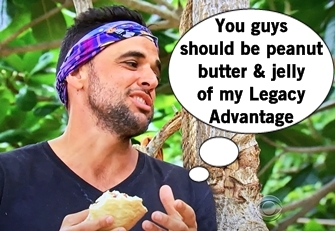 Naviti comes together in an aggressive Reward Challenge to win peanut butter and jelly sandwiches, but their division is apparent back at camp. Domenick and Wendall showed their cards in the last vote when they tried to vote out original Naviti member Andrea, but were instead blindsided by the Malolos move out oust Morgan (but hey, Domenick got a Legacy Advantage willed to him in the process). Domenick hopes they can turn their bad situation around when he shares the truth about his Hidden Immunity Idol with Wendall, and later Laurel. Meanwhile, Chris is talking to the Malolos to sway them to his side and target Dom. Will some mixing and mingling begin to happen to shake up Naviti? 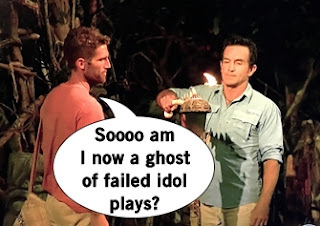 Malolo's so split down the middle that there's no negotiation possible when Malolo loses the Immunty Challenge after a stunning Naviti comeback. Keeping their 5-vote majority is so important that Kellyn declines to give up her vote for a chance at a power on Ghost Island. The five decide to vote off Michael or Brendan, which they expect surprise Malolo who will expect a woman to be voted off to keep the tribe strong. Brendan and Michael sense they are in trouble and decide to let Stephanie and Jenna in on the secret: Michael has his Hidden Immunity Idol and can use it to save their group. The foursome feel so relieved and they plan to very openly target Bradley at Tribal Council and flash the idol in the hopes that one of the bottom of the Navitis will flip their vote. Tribal Council time! Naviti is very open they're sticking together and it's not changing. Stephanie says they tried to save themselves but Bradley made sure to block any chance for Malolos to talk to the Naviti members. Michael says Naviti might put on a show they're an alliance of five, but the two on the bottom are Chelsea and Sebastian. Brendan chimes in to continue digging Bradley's grave and try to get someone to come to their side. And so Michael makes the big move to sell it: he busts out his Survivor: China James idol and tells the group that James left the game not playing two idols so this new idol of his legacy can save two people (it can't, but stellar line). Navitis thrown for a loop with this revelation and Michael pleads for someone to join them because they're not a tight four, they were forced together by circumstance. The tribe votes and Michael gets up to play his idol, which he plays on Stephanie. Michael played up a stellar lie but misjudged the target and instead the five Naviti stick together and vote Brendan out of the game.